Rachel E. Copeland continues to receive acclaim as a “revelation with her coloratura soprano leaping easily to impossible heights!” She is a sought after artist combining her crystalline voice with her compelling and energetic stage presence. 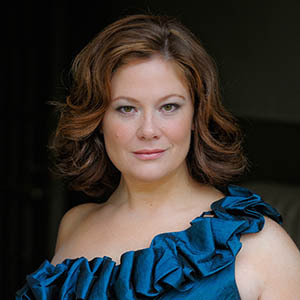 Ms. Copeland recently debuted at Avery Fisher Hall as the soprano soloist in Mozart’s Coronation Mass to rave reviews as well as performances with the Brussels Chamber Orchestra in a concert of arias and duets. Other career highlights include the Contessa in Mozart’s Le Nozze di Figaro with Cleveland Opera Theater, Frasquita in Bizet’s Carmen with San Diego Opera, Micaela in Peter Brook’s Le tragédie de Carmen with Indianapolis Opera, and Woglinde in Wagner’s Das Rheingold and first nymph in Dvorak’s Rusalka with North Carolina Opera. She returned to Apollo’s Fire, the Cleveland Baroque Orchestra in 2013 to great acclaim as the Queen of the Night in Mozart’s The Magic Flute, including a national broadcast and her debut at Severance Hall, the prestigious home to the Cleveland Symphony Orchestra. Other considerable performances include Ms. Copeland’s appearances as Zdenka in Strauss’s Arabella, Musetta and Mimì in La bohème, Lauretta in Puccini’s beloved Gianni Schicchi, Lucia in Donizett’s Lucia di Lammermoor, Juliette in Gounod’s Romèo et Juliette, Adele in J. Strauss’ Die Fledermaus, Mabel in The Pirates of Penzance, and Papagena in The Magic Flute. Internationally, Ms. Copeland has performed the roles of Donna Elvira in Mozart’s Don Giovanni and Adina in Donizetti’s L’elisir d’amore. Dr. Copeland is frequently sought after as a master class technician both nationally and abroad and has been on the faculty of the Cornish American Song Institute in Falmouth, England since 2016. During the summers of 2011 and 2012, Dr. Copeland was a faculty member of Musica nelle Marche in Urbania, Italy. Administratively, Dr. Copeland serves at General Manager for the Hawaii Performing Arts Festival and has previously served in the positions of Program Director and Operations Manager for Oberlin in Italy in Arezzo, Italy. Dr. Copeland holds the Doctor of Music degree in Vocal Performance with a minor in Music History from Indiana University; the Master of Music degree in Voice Performance from Baylor University; and the Bachelor of Music Education degree in Choral Conducting from Baylor University. Beginning in the Fall 2018, Dr. Copeland will begin an appointment at Penn State School of Music.